Discussion in 'Torment V2.0' started by Luxord, Aug 8, 2018. Dig, dig, dig deeper into the mine and then..
Let's conquer the 13th esper! Lounas, xTeKt0n1c, Monzi and 4 others like this. I barely managed to Sub-30 the first dungeon thanks to that idiotic paling mechanic. Haven't attempted anything else yet, and I'm not in the mood anyway. Tirix887 and Luxord like this. Hibernis, Tirix887, Luxord and 1 other person like this. Lounas, Hibernis, Luxord and 1 other person like this. Vaan's bsb, Basch's lmr, Ashe's bsb, Vayne's usb and Larsa's bsb/proshellga ssb. Hibernis, Deuce and Tirix887 like this. This one is hard. This Sunday I think I will redo some of my offensive magicites in favor of Spell/Blade ward. Not having a last stand hurts here. Tirix887, Luxord, Hibernis and 1 other person like this. Oh man. I need to pull for Ashe stuff one day. She's my only powerhouse in this realm. And if I can get Vayne stuff it will be nice too. 84%. Keeps me on track to get all the abilities, so not sweating on beating him (or Gilgamesh) for now. Feels easier compared to Gilgamesh. Once you get to the last phase the damage is simply overwhelming. Even at completely full health, the piercing AOE dark move kills both Ashe and Vayne, who are my best DPS. The very next move deals 35% max HP. (It's either 35% or 50%, I have read both here and here. This is pretty much where I get wiped. survive if I get lucky and time my heal right. Tirix887, Luxord and Deuce like this. I did it! It was not pretty or fast, but it's done. I had to swap out Balthier for Vaan because without the stacking magic breaks, I could not survive. Used Evrae as main magicite to lower dark elemental power. 2 spell wards, 2 Health boons. This by far was harder than the previous 2 neo torments. 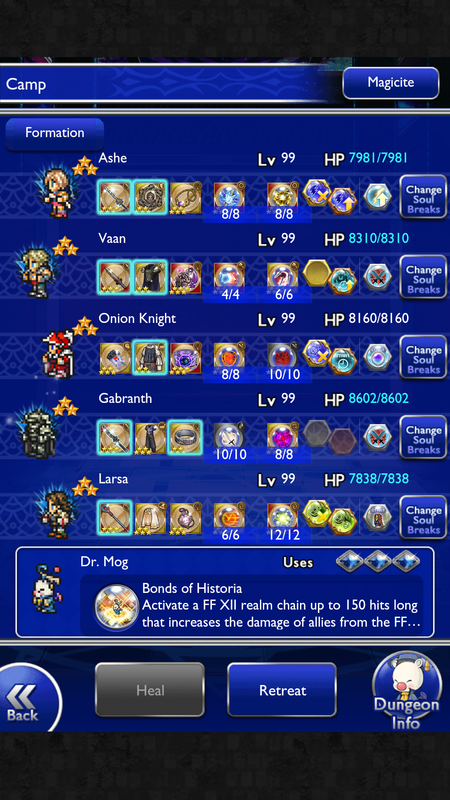 Until we get 5* magicites I think stacking breakdowns is the only way to survive for now. Tirix887, Deuce, Luxord and 1 other person like this. @Jamie so what magicites did you bring? did you use one magicite with 2 spell wards, one with 2 health boons and one with 2 lvl 10 dampen dark? 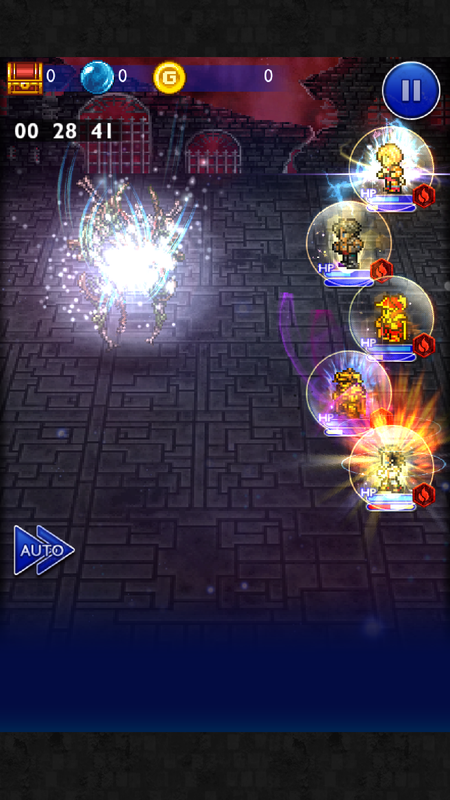 These magicites are definitely not ideal, but they did the job. I actually create the firemane just for this fight. All my magicites are 100% inherited. I just now realized I could have switched out marilis for something different, like another Evrae. I had that in there before I switched out Balthier. I have every intention of doing it again to make a video. Luxord, Deuce and Hibernis like this. Not as good as my first run but I was able to do it a 2nd time for a video (after many many attempts). Lounas, Tirix887, Deuce and 2 others like this. Well, the recent Golden Festival granted me more options to attempt D280 sub30. Unfortunately, Fran is a tad too slow for initial setup; hence swapped out for OK with LMR. Also, Penelo USB was nice and all, but I needed more DPS; hence Gabranth USB steps up to prove it's worth. And proven itself it did. 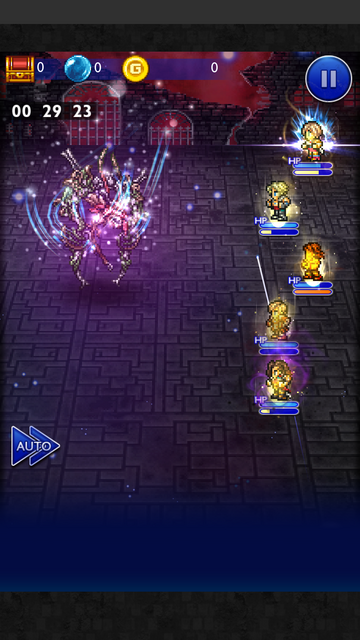 Killing blow by 2nd IC Vaan BSB. Deuce, Luxord and Vic like this. Getting Ashe USB has allowed me to lower my time by 21 seconds!